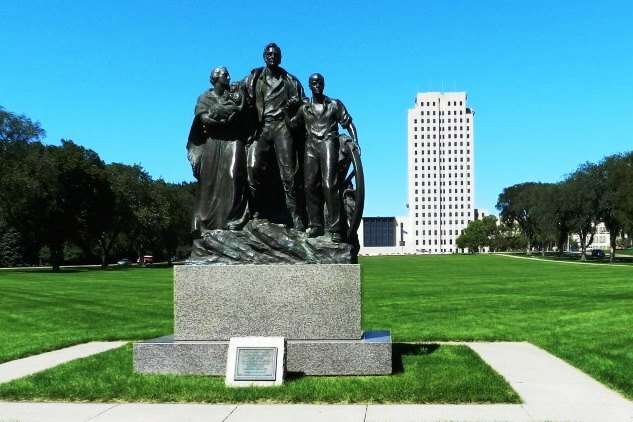 North Dakota became a state November 2, 1889, the 39th state admitted to the Union. Mandan tribes settled here in 1575. Lewis and Clark camped near here in 1804. First known as Missouri Crossing, then Edwinton, in 1873 Henry Villard, Secretary of Northern Pacific Railroad, renamed the city Bismarck. He sent a map of the new settlement to Germany’s Chancellor – Prince Baron Otto Eduard Leopold Von Bismarck-Schoenhausen – in hopes of attracting German investment capital for building a transcontinental railroad. That didn’t happen, but throughout the latter half of the 19th century and into the 20th, farmers immigrated to the area from Germany. Today the ancestry group in this rich farming region is 47 percent German. The capitol, called the Skyscraper of the Prairies, was completed in 1934. It is 18 stories high and has an observation tower and exotic wood paneling in its distinctive interior. On the expansive grounds are the North Dakota Heritage Center, showing the settlement of the northern Great Plains, and statues of The Pioneer Family and Sakakawea. The Lewis & Clark Riverboat offers cruises on the Missouri River; at Fort Abraham Lincoln State Park, re-creations allow a glimpse of the Mandan settlement that Lewis and Clark came upon in 1805 at On-A-Slant Village. Theodore Roosevelt National Park is to the west on I-94. The no-nonsense simple way of life, the hearty German style and Knoephla soup, the Indian Village on a Slant, the legends and the truths of Sakakawea and Pomp, the golden sunflowers nodding in the sun, the farming and the growing things. Mountains near: Killdeer and Turtle; White Butte, in the southwest corner of the state, is the highest point in North Dakota at 3,506 feet.